There are too many types of materials for canopies manufacturing (F-111, ZP Gelvenor, ZP Soar-Coat etc.) That is why the canopies of the same size but made by different manufacturers may differ in terms of pack volume. There is a great demand in containers for canopies of significantly different sizes: cross-brace canopy Main chute and the Reserve with large surface for a heavy-weight skydiver or large Main chute and small Reserve chute for accuracy parachutist. This is why for each canopy size requested we apply a computer calculation system and design, to construct the most suitable container, after that the container receives its individual dimensional number. The general principle of numeration: two-digit number, where the first digit is the size of the Reserve and the second is the size of the Main. For example, you can see the containers on the photo 26 (120 Reserve, 160 Main) и 62 (160 Reserve, 120 Main). The size of a container may be identified by the description on the label (stripe) located on the risers of the Reserve, on the area of «Cont. size». 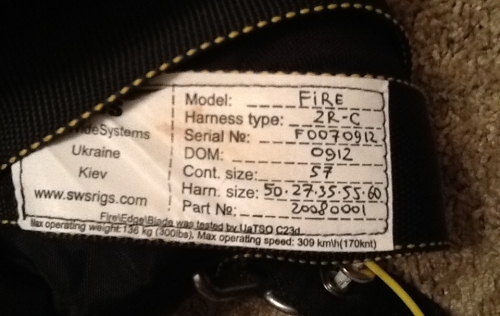 The size of the harness system is coded with 5 digits in the area of «Harn. size», where the first digit is the length of the container, the second is the length of Yoke, the third is the length of MLW, the forth is the size of the lateral strap, and the fifth is the length of the leg straps. If you are planning to acquire a used Fire parachute system and if you have any doubts in its suitability for a canopy size and/or for a harness system, please contact SWS. Provide us with the serial number and the date of production and you will obtain the info of the suitability of this container.